If IPART’s recommendations are adopted, it will see fare integration added to Opal. Sydney had this briefly with under myZone, where it was cheaper to buy a myMulti ticket than separate tickets for different modes such as train and bus. But it was still more expensive to buy a myMulti ticket than a single mode ticket for any given journey. IPART resolves this somewhat, opting to calculate the fare as though the most expensive mode was taken the whole way. The result therefore is not a return to myZone, but an improvement on it. There will no doubt be some temptation to look for winners and losers in these changes. This is a temptation that should be resisted. Passengers base their travel patterns on the fare structures, not the other way around. Back when Opal was first introduced there were fears that users would pay more. Instead what happened in most cases was that travel patterns changed in order to minimise fares, and so fare revenue dropped while public transport usage rose. The changes to the travel rewards system, free aver after 8 journeys and the $2.50 cap on Sundays, was a framework that lent itself to “gaming the system”. The proposed changes (passengers pay for their 10 most expensive journeys each week with a $7.20 cap on weekends) are not perfect, but they are a much better method of calculating fares. For those not gaming the system, they will enjoy cheaper travel. Those who do will mostly alter their travel patterns to reduce their total cost. The imperative now is to look for ways to improve the proposals by tweaking them around the edges, rather than seeking to reject it entirely for going too far or reject it for not going far enough. We have waited too long for integrated fares, let’s not delay further. Light rail between Parramatta and Olympic Park, announced today, is the culmination of years of planning and proposals for light rail in Western Sydney. To fully recognise the significance of this announcement, it’s worth going back almost 4 years into the past to see how this ultimately developed from the ashes of the Parramatta to Epping Rail Link. The change of state government earlier in the year saw the dropping of the Parramatta to Epping Rail Link as official government policy, which in turn sparked Parramatta City Council to push for a light rail line instead. It sought to mimic the work of Randwick Council, whose pre-feasibility study into light rail to Randwick resulted in the now CBD and South East Light Rail line from getting the green light from the NSW Government. In both cases, light rail would link a CBD, university, stadium, racecourse, and hospital. 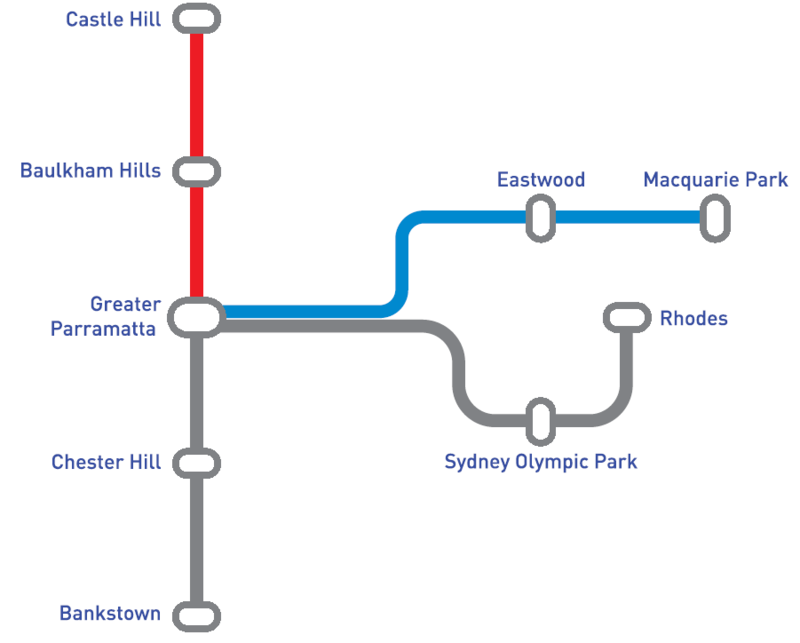 The initial pre-feasibility study recommended a 169km light rail network, with lines linking Parramatta to Macquarie Park via Eastwood, Epping via Carlingford, a loop to Olympic Park and Rhodes, Bankstown, Castle Hill, Rouse Hill (on the existing T-Way), and Liverpool (on the existing T-Way). It also included a line from Cabramatta to Rouse Hill via Blacktown and Parklea (on the existing T-Way between these two suburbs). The lines were estimated to cost $9.5bn, based on the cost of the Dulwich Hill light rail extension and Gold Coast light rail. The final pre-feasibility study by Parramatta City Council concluded that two lines should be built first: one from Westmead to Macquarie Park via Parramatta and Eastwood, the other from Parramatta to Castle Hill via Baulkham Hills and Castle Hill Showground. These lines would be 30km in length, cost $1.5bn to build, and require 21 trams in order to provide 10 minute frequencies (Source: Western Sydney Light Rail Network – Part 2 Feasibility Report, p. 5). They would then be followed by two additional lines, one to Bankstown via Chester Hill, the other to Rhodes via Olympic Park. Urban Growth NSW, the Government’s development agency, publishes a report about Parramatta showing a light rail alignment on one of its maps. Though not much more than lines on a map, it is the first time that light rail has appeared in an official government report. When asked about this by the Daily Telegraph, the Transport Minister Gladys Berejiklian confirms that light rail is “in the mix”. The Opposition Leader John Robertson announced plans for a $20m full feasibility study into light rail around Parramatta if elected in 2015. This would build on the Parramatta City Council’s pre-feasibility study completed in 2013. The NSW Premier Mike Baird announces a $10m full feasibility study into light rail around Parramatta. Though less than the $20m promised by his opposition counterpart 2 months earlier, this study commences immediately. With a feasibility study underway on 10 potential routes, the NSW Government commits $400m in funding to pay for the new line. An additional $600m would later be committed from the sale of the electricity distribution network, bringing the total funds committed to $1bn. The Transport Minister Gladys Berejilkian stressed the importance that any light rail line should connect Parramatta up to both Westmead hospital and Western Sydney University (then still named UWS). With Westmead to Macquarie Park being the only one of the 10 potential routes that passes through both the education and health precinct, this suggested that the Westmead-Parramatta-Eastwood-Macquarie Park alignment that Parramatta City Council had previously pushed would be the one chosen. An announcement by the Premier Mike Baird that a $2bn urban renewal project of North Parramatta would bring 6,000 new apartments builds on the earlier report in March that these developments are likely to be supported by additional infrastructure. The area is located around one of the proposed light rail alignments between Parramatta and Westmead, which heads North from Parramatta before passing Parramatta Stadium and then crossing the Parramatta River on the Northern end of Westmead hospital. The earlier 10 routes were reduced to a final 4 routes on the shortlist, which would then be investigated in greater detail. 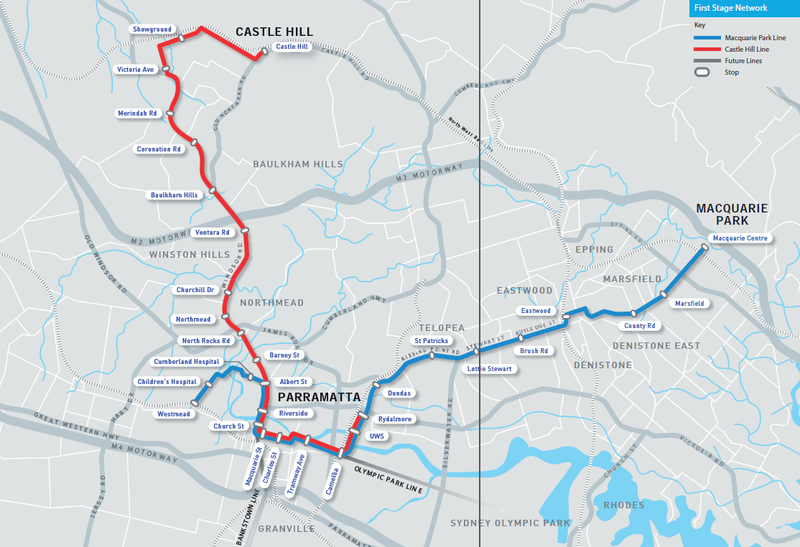 The 2 lines proposed by Parramatta City Council, Parramatta to Macquarie Park via Eastwood and Parramatta to Castle Hill via Windsor Road, did not make the shortlist. Instead, a line to Macquarie Park via Carlingford would be investigate as would a line to Castle Hill via Old Northern Road. In addition to these 2 routes, a line to Strathfield/Burwood via Olympic Park and a line to Bankstown would also be investigated. These again mirror the routes investigated by Parramatta City Council, though its Olympic Park line would extend out to Rhodes rather than Strathfield. A coalition of businesses, developers, and councils begins to push for a line from Parramatta to Olympic Park. The group; calling itself the Westline Partnership and comprising of the ANZ Stadium, the Australian Turf Club, Accor, Dexus, Sydney Olympic Park, Sydney Business Chamber, Auburn council, and Canada Bay council; claims that doing so could unlock $2.9bn of funding through “value capture” in the form of developer levies. Doing so would allow the Government to build two lines, one to Olympic Park and the other to Carlingford, according to Westline Partnership spokesman Christopher Brown. The NSW Government begins to hint that it is shifting from Macquarie Park to Olympic Park as its preferred option. The Roads Minister Duncan Gay accidentally says that light rail will be coming to Olympic Park while outlining improvements to the nearby WestConnex project. Both Olympic Park and Parramatta had recently been hit by the announcement that the Commonwealth Bank would be moving its operations out of both those suburbs and into Redfern’s Australian Technology Park. The move resulted in criticisms towards the NSW Government for not being quicker in its decision making on a route for any Western Sydney light rail line. The Premier Mike Baird announces that two light rail lines are to be built simultaneously from Parramatta: one to Olympic Park and one to Carlingford. Both lines will travel along the same corridor through to Camellia before branching off. The project will raise funds through the use of a Special Infrastructure Contribution (SIC), “expected to be set at around $200 per square metre of gross floor area of new residential developments subject to consultation”. This is in addition to the $1 billion already committed by the NSW Government, with the Government also seeking contributions from the federal and local governments.